Waarom Assad en de Syrische souvereine Victorie zulllen kraaien. Assad zal winnen!!! De VS greep niet in tijdens het door Saoedi-Arabië en de golfstaten gesteunde bloedbad in Egypte en twijfelt ondanks alles aan het afsnijden van de financiële hulp voor Egypte. Amerikaanse hulp voor de Syrische rebellen zou enkel in de handen van al-Qaeda vallen en Obama zal dat niet toestaan zegt the chairman of the Joint Chiefs of Staff, Gen. Martin Dempsey. De houdbaarheidsdatum van de terroristische wegwerptools van het westen in de Syrische souvereine is dus definitief verstreken. Door in Egypte extremisten op te ruimen doet het Egyptische leger de Amerikanen een grote gunst. Zowel al-Qaeda als Assad zijn vijanden van Amerika (Het Beloofde Land). Laat ze elkaar afmaken en zichzelf verzwakken. De hier op het forum reeds lang besproken stalemate-strategie in de praktijk. De VS wil niet dat de Syrische wapens in de handen van al-Qaeda vallen. Al-Qaeda is een grotere dreiging dan Assad, de VS herinnert zich hun vorige ervaringen met de mujahideen. Geen enkele strijdende partij in de Syrische souvereine deelt gemeenschappelijke doelstellingen met de VS, aldus the chairman of the Joint Chiefs of Staff, Gen. Martin Dempsey. Geen daadwerkelijke Amerikaanse militaire hulp bereikt de rebellen nog, enkel woorden. De VS heeft zich vergist door de Arabische lente als een schreeuw om democratie en vrijheid te interpreteren, het volk protesteerde enkel tegen economisch wanbeleid en armoede. Niemand gelooft nog in de 'moslimdemocraten'. Amerika is van gedacht veranderd en heeft het steunen van de moslimbroederschap en andere Islamitische groeperingen opgegeven (RIP MB, FSA en andere Syrische rebellen. Erdo wordt paranoia...). Assad weet het, hij zal er met de grove borstel doorgaan tot het laatste stuk vuiligheid opgeruimd is. 21 augustus 2013 door Michael Hirsh - Why Assad Will Win - The U.S. is giving up on the Arab Spring, and the Syrian dictator knows it. Bashar al-Assad is, finally, having a very good week. The latest allegations of chemical-weapons use against the Syrian dictator don't matter nearly as much as other dramatic developments—in particular, the United States' willingness to stand aside while Assad's autocratic brethren in the Egyptian junta cold-bloodedly killed some one thousand protesters, supported by the Saudis and Gulf states. And this week, the chairman of the Joint Chiefs of Staff, Gen. Martin Dempsey, finally said plainly what Obama administration officials have been thinking privately since June, the last time Washington said its "red line" had been crossed and pledged military aid to the Syrian rebels—then did nothing. In a letter to Rep. Eliot Engel, D-N.Y., Dempsey said flatly that U.S. aid to the rebels know would just end up arming radical, possibly al-Qaida-linked groups. And Obama wasn't going to allow that to happen. What it all means is that we may now be at a historic turning point in the Arab Spring—what is effectively the end of it, at least for now. 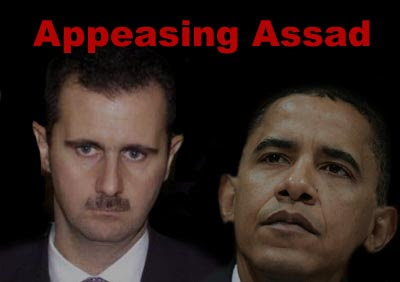 Assad, says Syria expert Joshua Landis, is surely taking on board the lessons of the last few weeks: If the United States wasn't going to intervene or even protest very loudly over the killing of mildly radical Muslim Brotherhood supporters, it's certainly not going to take a firmer hand against Assad's slaughter of even more radical anti-U.S. groups. "With a thousand people dead or close to it, and America still debating whether to cut off aid, and how and when, that's got to give comfort to Assad," says Landis, a professor at the University of Oklahoma. "The Egyptians brushed off the United States and said…. Well, we don't want to end up like Syria. And America blinked. And Israel and the Gulf states were in there telling them to hit the protesters hard." What began, in the U.S. interpretation, as an inspiring drive for democracy and freedom from dictators and public corruption has now become, for Washington, a coldly realpolitik calculation. As the Obama administration sees it, the military in Egypt is doing the dirty work of confronting radical political Islam, if harshly. In Syria, the main antagonists are both declared enemies of the United States, with Bashar al-Assad and Iran-supported Hezbollah aligning against al-Qaida-linked Islamist militias. Why shouldn't Washington's policy be to allow them to engage each other, thinning the ranks of each? And by all accounts, the administration and the Pentagon simply don't want to risk the "blowback" that could occur if the Assad regime collapses and serious weapons fall into the hands of al-Qaida. As one Washington-based military expert points out, Assad is just not enough of a threat to U.S. interests. "Look at how long it took us to decide to back the mujahedeen in the 1980s against the Soviet Union. Syria is not the Soviet Union," the expert says. Dempsey, in his letter, said that deciding what to do about Syria "is not about choosing between two sides but rather about choosing one among many sides." He added that "the side we choose must be ready to promote their interests and ours when the balance shifts in their favor. Today, they are not." On Wednesday, in a replay of what happened a year ago, the administration appeared to push for more time in ascertaining whether Assad had used chemical weapons. White House spokesman Josh Earnest said the administration was "deeply concerned by reports that hundreds of Syrian civilians have been killed in an attack by Syrian government forces, including by the use of chemical weapons," but was working "to gather additional information." This is familiar ground. Back in June, Deputy National Security Adviser Ben Rhodes said in a statement that the administration would start supplying the Syrian rebels' "Supreme Military Council" and "consulting with Congress on these matters in the coming weeks." But there is little evidence that any military aid has reached the rebels. President Obama's biggest problem in terms of his credibility is that he's wedded to a "narrative" that won't stand up to scrutiny any longer, says Landis. "We started this off saying it was about democracy and freedom. We've stuck to that interpretation. We didn't say this is about economic mismanagement and poverty," which is what the protests were largely about. But now "nobody believes they're democrats anymore. That's the problem. What we saw in Egypt signals that America has changed its mind and has backed away from the Muslim Brotherhood and all these Islamic groups. And the Syrian rebel groups are to the right of the Muslim Brotherhood." Zij die de topic 'Onrust in Syrië' en vele andere relevante topics nauwgezet gevolgd hebben konden uiteindelijk deze ontwikkeling nauwkeurig voorspellen. Op naar een spoedige beëindiging van de 'Onrust in Syrië' en het herstellen van de integriteit van de Syrische souvereine en al haar instellingen, moge het Syrische volk opnieuw voorspoedige tijden kennen. Video - Terrorists will lose! We will probably never know whether Bashar al-Assad lost any sleep over the horrific chemical weapons attacks he allegedly ordered during his country’s ongoing civil war. But Syria’s president has probably already taken solace in the fact that, despite the hundreds of thousands of Syrians who have lost their lives in the fighting, things could have easily gone worse for him personally. With insurgents losing ground to the regime’s forces and succumbing to ever more infighting among themselves, it seems increasingly likely that Assad will avoid losing the war -- which will qualify, in this context, as an outright win. For the many countries, including the United States, that have based their policies on the hope that Assad would eventually be forced from power, Assad’s resilience has probably come as a disappointment. (But given their generally indecisive interventions in the war, the outcome should not come as a shock.) Nevertheless, Washington and its allies need to reckon with the bitter trajectory that Syria is now on. The regime that emerges from the civil war will be more oppressive and more anarchic than the brutal yet stable one that existed before the war. First, it is important to understand what victory will mean. In order for Assad to consider himself the winner of this conflict, his forces would need to gain control over the 40 percent of Syrian territory, concentrated in the western part of the country, where 60 to 70 percent of Syrians live. (A key military objective will be to secure the M5 north-south highway that connects Damascus to Homs, Hama, and the hotly contested city of Aleppo.) At the same time, Assad would need to clear out pockets of resistance behind the regime’s main lines. (This is exactly what he has already achieved in Qusayr and the area around Homs, giving his fighters unimpeded access to the Bekaa Valley and Hezbollah-controlled areas of Lebanon.) If Assad achieves all that, he will have gained a secure hold on his rump state for the indefinite future -- and a favorable position in any eventual negotiations with the opposition. Of course, if Assad manages to stay in power, his level of control over the country will never again be what it was before the war. In part, that is because his government's geographic reach will be curtailed: Parts of the country (particularly in the northwest and along the Euphrates River) will remain under the control of the Syrian opposition -- including organized terror groups -- even if they have given up the immediate goal of toppling the Assad regime. Even in those areas where Assad maintains control, his authority will be greatly diminished. He has waged all-out war against his own country, resorting to the use of Scud missiles and chemical agents against civilian populations. Those tactics may have helped him stay in power, but they will also cost him every last shred of popular legitimacy. In turn, Assad will increasingly resort to brute force to demonstrate his authority to Syrians. His postwar reign of terror will likely target the majority Sunni population that has directed the uprising against him. The formerly “liberated” areas of Syria will probably have the most to fear. If the regime makes an effort to retake these areas, even temporarily, it is easy to imagine thousands of Sunnis being rounded up and subjected to the nation’s archipelago of prisons and torture chambers. And that will likely lead to waves of refugees fleeing for safety to other opposition-controlled areas in Syria or to neighboring countries. Any such campaign of sectarian cleansing would shape the entire region in new ways. Assad would likely rely on the shabiha, Alawite militias supported by Hezbollah and the Iranian Revolutionary Guards, to carry out his oppression; over the course of the war, these militias have proven more reliable than Syria's traditional security agencies at laying siege to opposition-controlled pockets in Syria. (The shabiha have already been used to displace -- and, the opposition alleges, massacre -- Sunni Syrians in Homs and the adjacent Orontes Valley.) In other words, Syria would be drawn into deeper alliances with Iran and Hezbollah. In response, Sunni countries in the region would probably try to support a continued Sunni insurgency -- even if that meant relying exclusively on jihadists with their own agendas. The upshot: Iranian and Hezbollah forces will probably remain in Syria indefinitely, permanently institutionalizing what had originally been an ad hoc arrangement. And the foreign-supported Sunni insurgency, mired in a stalemate with Assad, would likely begin to focus on international terrorism. It is unlikely that Syria’s secular opposition would find an amenable home in these ungoverned spaces; those who manage to evade torture or death at the hands of the Assad regime would try to form their own enclaves, or join the waves of refugees forced into exile. There is also the question of how Assad would try to repair Syria's destroyed economy. According to a study by the Syrian Center for Policy Research, total losses of the war are estimated at $85 billion, $40 billion in the first quarter of this year alone. The Syrian regime has burned through a lot of the estimated $17 billion in hard currency reserves it held at the beginning of the uprising, to compensate for combined U.S., EU, and Arab League sanctions on Syrian oil production -- measures that are unlikely to be lifted even if Assad holds on. To keep its head above water, Damascus has reportedly received up to $500 million per month and lines of credit from Tehran to finance food and oil imports. That dependence would undoubtedly grow in the years ahead. The Central Bank of Syria, reportedly with help from Russia, has also resorted to printing money, spurring monthly inflation rates of close to 35 percent. Extreme poverty -- the milieu in which extremists thrive -- would continue unabated. So any thought that an Assad victory will lead to stability in Syria should be tempered by the realization that he will be abjectly dependent on other countries for security and money. And that reliance will produce plenty of instability. The reconstituted Assad regime would be particularly beholden to Tehran, which would dramatically expand Iran's influence in the region and make it increasingly likely that Syrian and Lebanese territory would be used to confront Israel and other U.S. Sunni allies. Meanwhile, Syria's ungoverned spaces would become havens for Sunni or Kurdish extremist groups, akin to the lawless areas in Somalia where the al Shabab terror group operates. Even worse, these havens would be in areas adjacent to Israel’s borders, adding to Jerusalem’s always growing list of problems. And if Assad manages to maintain his authority in most of Syria, Israel could become an even more attractive target for those extremist groups and their sponsors. This analysis by Michael Hirsh is largely correct. Bashar al-Assad is looking at what's happening in Egypt and realizing that there is no way that the United States is going to help depose him. And given the alternatives, maybe that's how it ought to be for now. Given Obama's inability to admit mistakes (see, "Obamacare"), and his love for all things Islam ,we can only hope that he has actually backed off the Muslim Brotherhood. And he definitely missed the opportunity to depose Assad and install something reasonable two years ago. De Amerikaanse president Barack Obama ziet af van een snel militair ingrijpen in Syrië. Obama ziet het niet zitten om de VS onmiddellijk in een oorlog met Syrië te storten zonder de steun van een internationale conventie of een wettelijk mandaat van de Verenigde Naties, zo zei hij vrijdag. Obama zei zich wel zorgen te maken over het gebruik van chemische wapens door het Syrische regime. Vrijdag bleek uit eerste onderzoeksresultaten dat het Syrische regeringsleger wel degelijk chemische wapens heeft ingezet vlak bij Damascus. Eerder zou de Amerikaanse president hebben gezegd dat het gebruik van chemische wapens een absolute grens voor de VS zou zijn om tot interventie over te gaan. Vrijdag zei Obama echter dat wanneer er direct actie wordt ondernomen, dit mogelijk kan resulteren in "een erg moeilijke en dure interventie die juist meer rancune veroorzaakt in de regio. We moeten strategisch denken aan onze nationale belangen op de lange termijn", aldus de president. Daarom richt de VS zich vooralsnog op het organiseren van een vredesconferentie tussen de Syrische president Assad en de rebellen. Syrie zal er verzwakt uit komen, vele terroristen zullen de vrede vinden. Obama : "We moeten strategisch denken aan onze nationale belangen op de lange termijn", aldus de president." Amerikaanse nationale belangen : Het Beloofde Land. Belangen van Obama, zijn halfbroer, Erdogan, Qatar... de moslimbroederschap... RIP... game over. De Arabische Lente is voorbij. Geen democratie voor de moslims in het MO. Seculaire dictatuur blijft vooralsnog de beste oplossing. ALs bij de volgende verkiezingen in Tunesië de seculieren het halen (die kans schat ik hoog in) dan kan dat land volgens mij wel een goed draaiende democratie worden. CBS News has learned that the Pentagon is making the initial preparations for a cruise missile attack on Syrian government forces. Reuters - U.S. military and national security advisers met Obama at the White House on Saturday to consider options for a response, the day after Washington said it was realigning forces in the Mediterranean to give him the option of attacking Syria. Het is daar nog lang niet voorbij, en wie er zal winnen is koffiedik kijken. In ieder geal zal heit niet het Syrische volk zijn, hun land is kapotgebombardeerd en het volk telt honderdduizenden doden en eenveelvoud aan gewonden. For now, want ze zijn dus nog lang niet klaar met de wederzijdse afslachting. Hoe dan ook, mensen die blij zijn met de eventuele overwinning van de extrmlistische gruwelmoslims, en ook zij die thumbsup zitten te glunderen met de eventuele overwinning van de massamoordenaar en bloedige tiran Assad, allemaal die mensen zijn een schandvlek op de mensheid. Laatst gewijzigd door Antoon : 24 augustus 2013 om 21:45. Men kan hetzelfde zeggen van zij die de stalemate in stand houden en zo het slachten langdurig in stand houden om verzwakking van alle partijen te bekomen. U dus. Shame on u2. Obama & Cameron spoke for 40 mins on Syria. UK official tells TheSundayTimes discussed "serious response" including military action. TheSundayTimes reports "thinking in Whitehall shifted from whether should take military action to what it might do." Hoe lang nog tot de overwinning? Niet lang meer, eigenlijk heeft hij reeds gewonnen. De terroristen konden duidelijk de klus niet langer solo klaren. Het westen moet ingrijpen zodat de stalemate opnieuw kan gespeeld worden, de verzwakking van het regime en het uitschakelen van de snackbar terroristen is nog niet op het gewenste niveau. Een kleine reset naar zero en het spel gaat verder. Vandaag lijdt ook iedereen in Israel meer dan ooit onder deze uiterst gevaarlijke ontwikkeling. De chemische wapens moeten op dit moment van de kaart verdwijnen, zodat de nieuwe ultra bloeddorstige fase kan beginnen. Maar er zullen steeds van die afschuwelijke wapens overblijven, welke vanaf dat moment weldegelijk ingezet kunnen worden. Kortom, het westen is fout bezig. Dit betekent een gevaarlijke escalatie, vooral voor Israel. Laatst gewijzigd door zonbron : 26 augustus 2013 om 07:46.
eigenlijk heeft hij reeds gewonnen. Dit betekent een gevaarlijke escalatie, vooral voor Israel. Uw liefde voor Israel is aandoenlijk. Nee, geen liefde. Stick to the facts please. Ook daar leven mensen @Salah. Alhoewel het in Uw ogen allemaal slechts ongelovige honden zijn. Laatst gewijzigd door zonbron : 26 augustus 2013 om 08:13. Hmm. Nu beweren de Israelis bewijzen te hebben dat Assad inderdaad verantwoordelijk is. It is “crystal clear” that Syrian President Bashar Assad used chemical weapons five days ago in an attack that killed hundreds of people, International Relations Minister Yuval Steintz said Monday.